NOTICE: Be careful that some fluid will come out of the oil strainer. (c) Remove the 5 bolts, 3 lock plates and 7 shift solenoid valves. (a) Install the spring and check ball body. 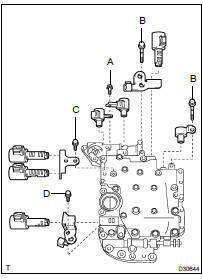 (b) Install the 7 shift solenoid valves and 3 lock plates with the 5 bolts. (c) Align the groove of the manual valve with the pin of the lever. First, temporarily tighten those bolts marked by in the illustration because they are positioning bolts. (a) Coat an O-ring with ATF. (a) Install the 2 magnets to the oil pan. (c) Install a new gasket, the oil pan and 18 bolts to the transaxle case. NOTICE: Apply seal packing or equivalent to the bolts and tighten them within 10 minutes of application.